(Ben) White Wash at Amnesty. Ben White showing off his well-trolled quotes at Amnesty last night. Ben White was last night handed the opportunity by Amnesty’s UK branch to call for the destruction of Israel. Not necessarily in the way Hamas would wish to achieve it, but White wants Israel changed from a Jewish state into another Muslim Arab state. This is what White thinks is “justice”. For that and other statements of his there was a small protest outside Amnesty last night. Once sign read “Amnesty is great, except on Israel”, which is probably about right. Amnesty will stand up against other human rights’ abuses except when they are against Israel. They raised their voice in anger when Gaddafi was cruelly tortured before being executed, but when Israeli soldiers are kidnapped or Israeli children are bombarded by Hamas rockets from Gaza Amnesty falls silent. Amnesty’s opposition to Israel’s existence is now, sadly, almost policy. Virtually no month passes without there being an anti-Israel event and never will there be a pro-Israel voice on the platform. One of Amnesty’s roles is to try to bury Israel. White was promoting his new book Palestinians in Israel: Segregation, Discrimination and Democracy and it will be instructive to jump straight to the end of last night’s talk. I can’t see Israelis ever voting for their state being changed into a Muslim Arab state, so what White is basically promoting is more war and bloodshed. White’s talk, probably like his book, was a long list of out-of-context and out-of-date quotes. 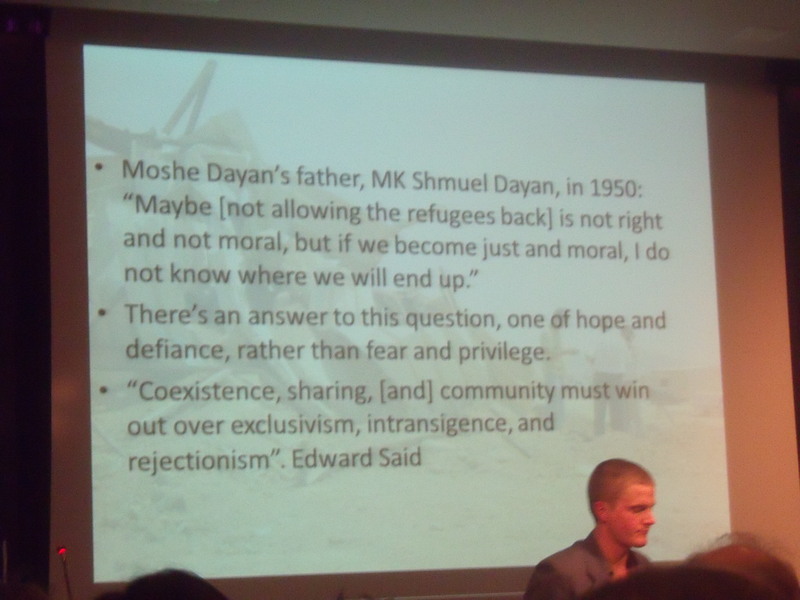 He started with an apparent quote by Balfour in 1919 – “in Palestine we do not propose to go through the form of consulting the wishes of the present inhabitants of the country” – and ended with one by Moshe Dayan’s father, MK Shmuel Dayan, from 1950 – “Maybe (not allowing the refugees back) is not right and not moral, but if we become just and moral, I do not know where we will end up”. White must spend many nights trolling through the internet and old books looking for quotes that support his pursuit of Israel, but it is obviously a money-making exercise judging by the queue of people waiting for him to sign their copy of his 90-page book. In between quotes he criticised Israel for what he calls the “Judaisation” of the Galilee and the Negev and for Israel not allowing “Palestinian citizens of Israel”, as he calls them, to live in Israel with their spouses who come from the West Bank and Gaza. The serious security implications for Israel if it allowed the latter are obvious, but Israel’s security isn’t high up on the list of White’s priorities. “The irony of the accusation of anti-Semitism against me in this context is that it is precisely opposition to all racism that informs my personal opposition to Israeli apartheid”. And when someone asked him about Hamas and its policies White simply said that the evening wasn’t about Hamas but he hoped that the questioner would “support efforts to end the discriminatory practices against the Palestinians”. It seems that Hamas is not much of an issue for White or Amnesty, whereas the Jewish state’s existence is. I bought this last night as no one else was buying. Professor Jonathan Rosenhead: Next target is Habima at the Globe in May. LSE Professor Jonathan Rosenhead, Chair of the British Committee for the Universities of Palestine (BRICUP), who helped to disrupt the Israel Philharmonic Orchestra’s concert at the Royal Albert Hall on 1st September 2011, has said that the performance by the National Theatre of Israel (or Habima) of The Merchant of Venice at the Globe Theatre on 28th and 29th May will be the next target for anti-Israel activists. He said that they had purchased 45 tickets (see from 4 mins. 7 secs. in following clip) for the Israel Philharmonic Orchestra’s disrupted concert and he boasted about the BBC taking the concert off air. 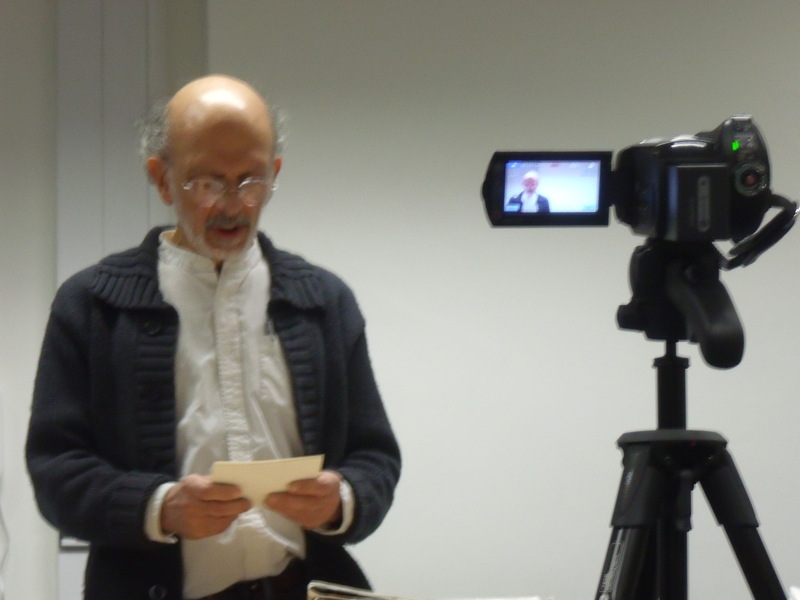 He was speaking on Friday at King’s College London about the academic and cultural boycott of Israel. 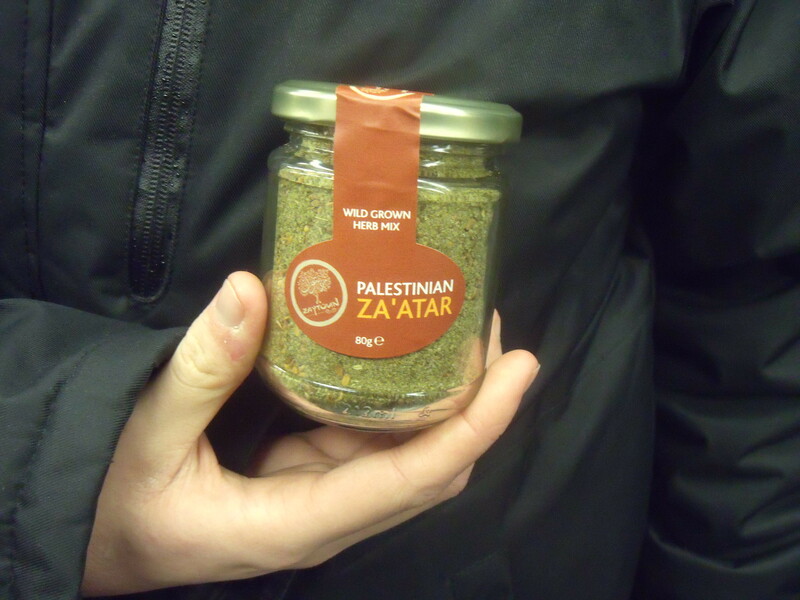 KCL is one of the organisations conducting research with Ahava through an EU-funded project called Nanoretox and activists are, once again, claiming, without any substantiation, that Ahava is based on an illegal settlement. 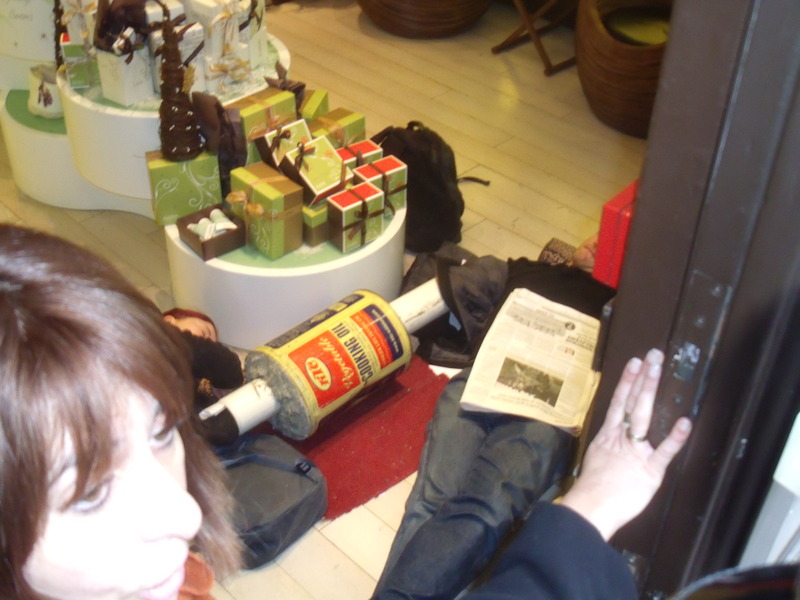 Last April four activists were found guilty of aggravated trespass for their efforts in disrupting business at the Ahava store in Covent Garden. District Judge Ian Baker found that Ahava was “trading lawfully” and gave Gwendolen Wilkinson, Matthew Richardson, Jessica Nero and Christoper Osmond 18 month conditional discharges and ordered them to pay £250 costs each. When questioned further Rosenhead admitted to being one of the disruptors of the IPO and he welcomed any prosecution that might follow seeing it as an opportunity to publicise their cause. 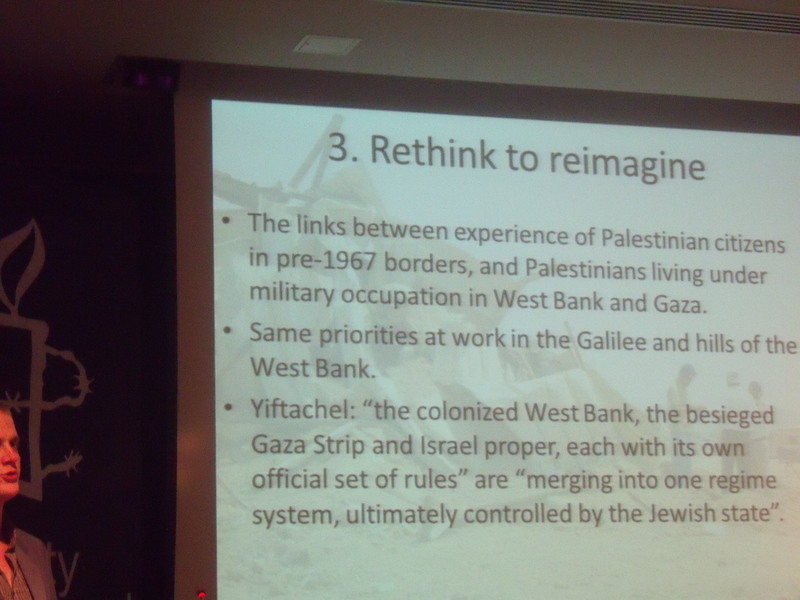 I had initially gone to KCL to hear Omar Barghouti speak. Barghouti is a member of the Palestinian Boycott, Divestment and Sanctions National Committee (BNC) and holds degrees from Columbia University and…..Tel Aviv University. He compares himself to Nelson Mandela who, he says, studied in an apartheid South Africa university, when he was asked how can can claim to be part of a boycott movement while having studied in the country, Israel, he is supposed to be boycotting! The parallel with Mandela fails on every level, but specifically because Barghouti is neither Israeli nor Palestinian having been born in Qatar and having grown up in Egypt, whereas Mandela is South African! I was hoping to show footage of Barghouti making the usual racist comparisons of Israel to Nazi Germany and apartheid South Afica (the man really knows how to demean peoples’ past sufferings), but, once again, I was stopped from filming under threat of being removed by security. I should have a right to film a public meeting, especially where there is racist rhetoric and where others are filming. Barghouti ordered that I stop filming as did the Chair of the event, Maha Rezeq. But both have no connections to KCL! Rezeq called my filming “unethical” on the basis that the footage will be available online. “The most important aspect that Palestinian citizens of Israel are involved in in terms of the BDS campaign is not to allow themselves or their institutions to be used as figleaves. Quite often Israel uses some Uncle Toms and (Aunt) Jemimas, whatever you want to call them, which exist in every society. I mean in every society you have people who wish to profit from self-interest rather than principle. It’s not a Palestinian phenomenon, it’s an international phenomenon. Some Jewish victims during the Holocaust were serving the Nazi victimisers. So in every sociey you get a small minority that betrays their own”. 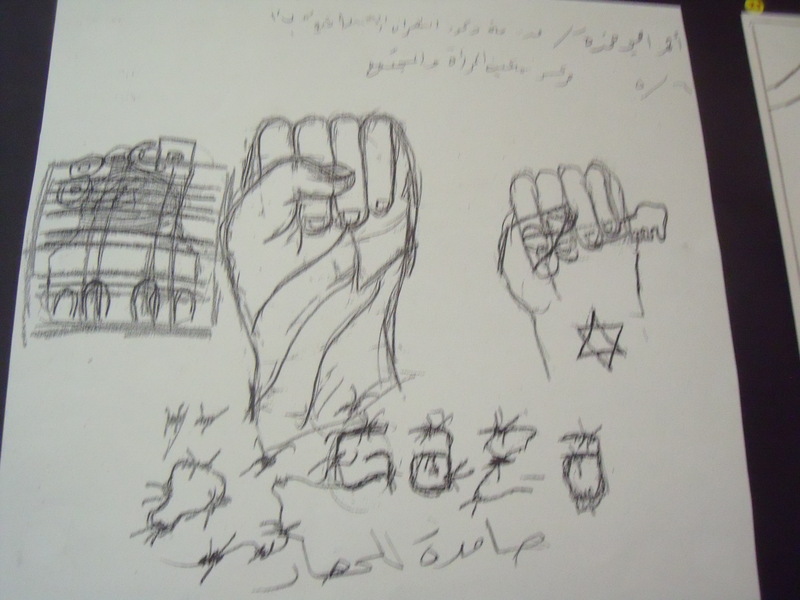 Jenny Tonge rants about the Holocaust and idolises Ismail Haniyeh. 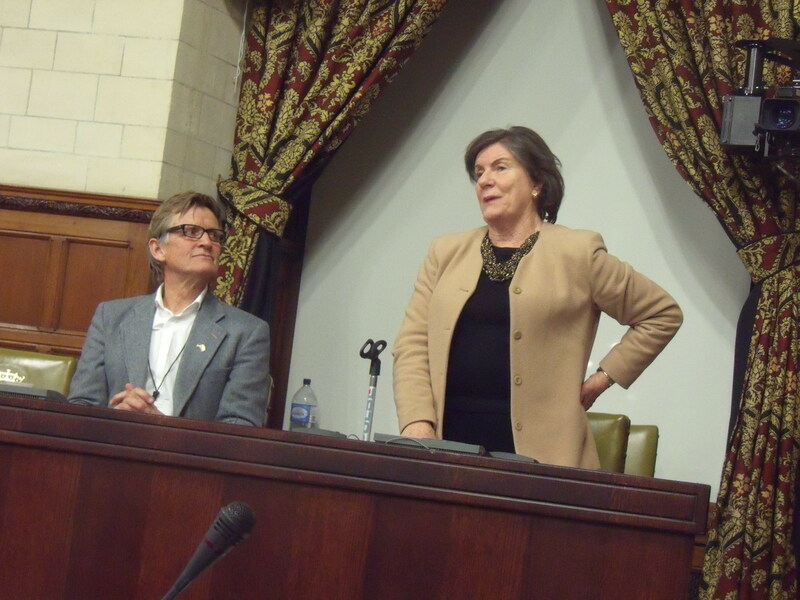 Mads Gilbert and Jenny Tonge last night in Parliament. 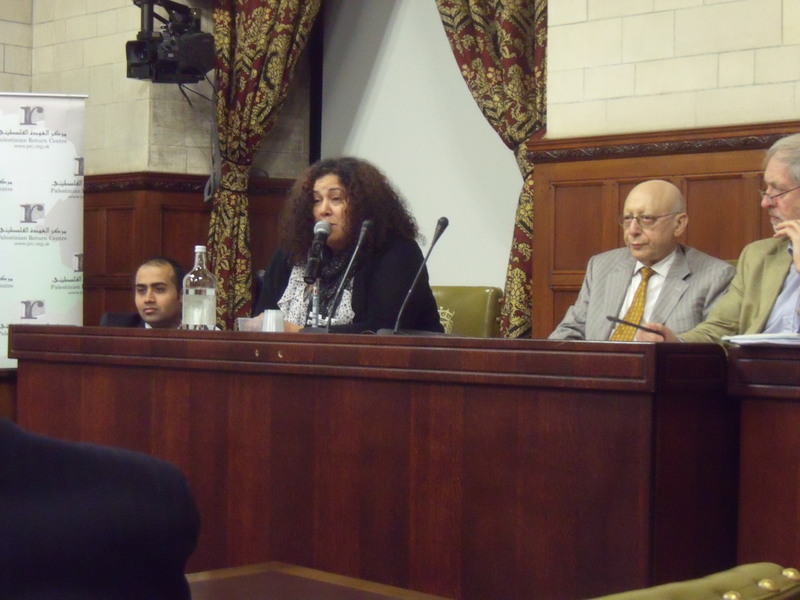 Last night yet another hate-meeting took place in Parliament with the Palestine Return Centre holding an event “to commemorate the memory of Palestinian victims over the past six decades especially the last war in Gaza”. (Here is what the PRC is all about. It makes unpleasant reading for Jews). Jenny Tonge was there ranting about how the Palestinians weren’t responsible for the Holocaust and asking “how can the Israelis treat the Palestinians the way they do after what happened in the Holocaust”. She criticised the power of the “Israel lobby” and held up a magazine with Hamas’ Ismail Haniyeh on the front cover and proceeded to idolise him. 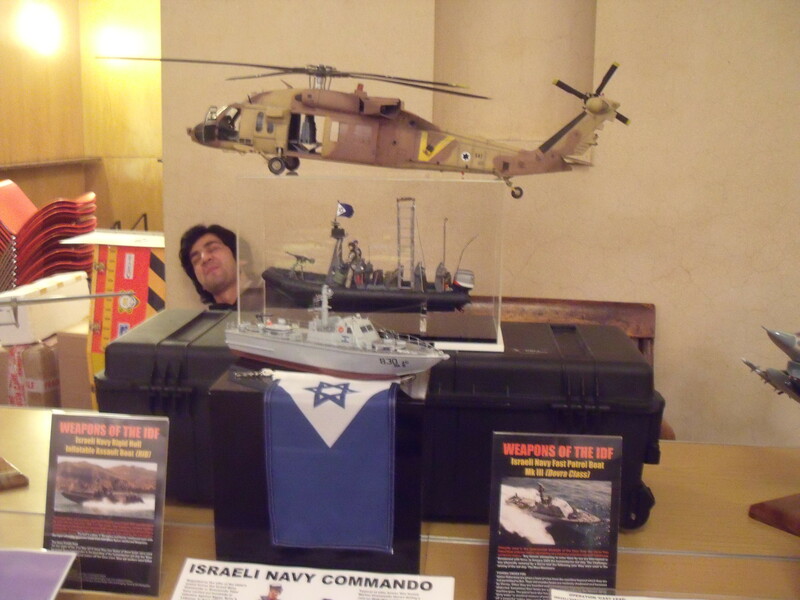 She told us about a Palestinian fishing-boat which was boarded by the Israeli navy off Gaza. She said the Palestinian fishermen had their hands bound behind their backs and were forced to swim to the Israeli boat. And she spoke about why she thinks she comes in for such heavy criticism and put this down to the fact that she stands up for the Palestinians and criticises Israel. The latter, she thinks, is viewed as being anti-Semitic. We also heard from Dr. Mads Gilbert, a Norwegian anesthesiologist, who gave us the names of Palestinian children who had been killed or who had horrendous injuries. He spent most of last night trying to flog his book about it all called Eyes on Gaza. Available from all good retailers. We heard from Manal Timraz. Manal lost 15 members of her family during Operation Cast Lead, 11 of which were aged between twelve and two, and has lost another four since. After asking us to stand for a minute’s silence she emotionally outlined how the only way forward is a one-state-solution. She lives in England next to a Jewish woman who “didn’t steal my land and I didn’t steal her’s”. Gilbert had called for an academic boycott of Israel and during the Q&A I asked him how he could propose such an obviously racist policy and whether he used any Israeli products himself. He said that the accusation that he was “a racist” was “absolutely preposterous” (I didn’t call him “a racist”) and said that he used computers without Intel chips. He then accused me of “smiling and laughing arrogantly” while Manal was speaking. I was smiling, but only at Manal’s suggestion that Jonathan go to the West Bank with her to drink tea “like a Palestinian”. “If you want to look for anti-Semitism don’t look among us because we are profoundly anti-racist”. He’s even friends with a Canadian Jew! But how can anyone seriously claim to be “profoundly anti-racist” while hero-worshipping a self-confessed Jew hater (see Hamas Charter) like Ismail Haniyeh? 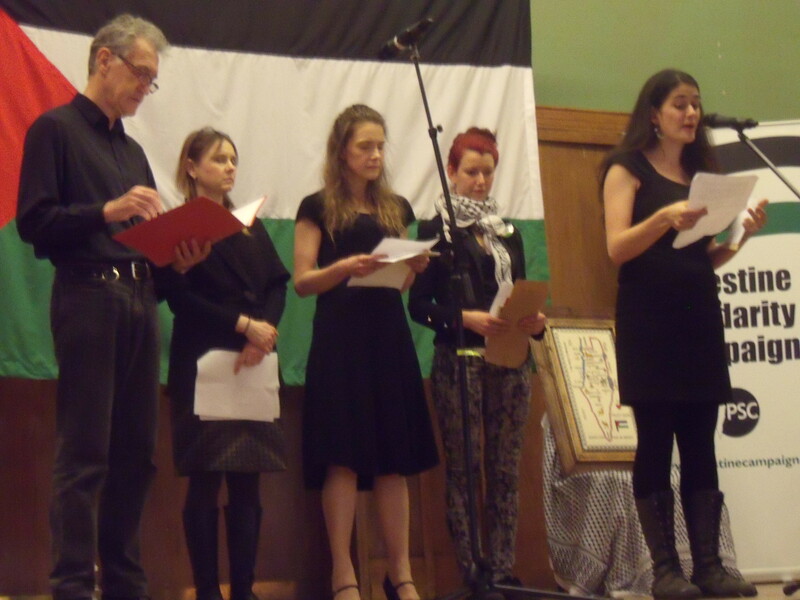 British Palestinian Manal Timraz speaking last night. 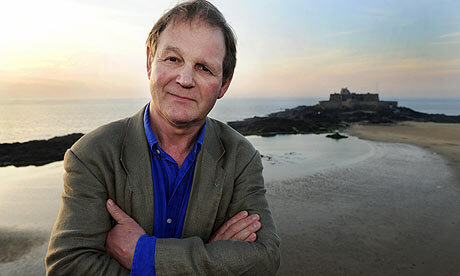 War Horse writer Michael Morpurgo: Israel shoots Palestinian children “like a video game”. The film of War Horse, adapted from the novel by Michael Morpurgo, has just been released in the UK, but as well as horses being killed on screen there is something else for filmgoers to cry into their popcorn over. Morpurgo is happy to repeat vicious lies about Israel without seeming to bother checking facts. Last February Morpurgo was given the honour of reciting the Richard Dimbleby lecture, which has been delivered by an influential figure every year since 1972, and he chose to speak on the lack of childrens’ rights around the world. He pointed out that 8 million children a year die before the age of 5. As he said, “that’s a holocaust of children every year”. He also mentioned that “69 million children never go to school” and that “3.5 million children in our own country are still mired in poverty”. Most of those 8 million children die from AIDS, war, malaria, malnutrition and other diseases in Africa. But Morpurgo failed to say anything about that instead choosing to spend a large portion of this high profile speech on the darlings of the left, the Palestinians, and invoking the modern day version of the anti-Semitic blood libel. He relied on statements of those with an anti-Israel agenda. He said he went to Jordan 10 years ago and met Jordanian children “about eighty per cent of whom are Palestinian refugees”. They are not refugees by any normal definition, but are simply born and bred Jordanians. Obviously, her “Palestine” means Israel and this was a call for the destruction of the Jewish state with its hidden aspiration for all Palestinians to head for Israel and turn it into another Arab state. Morpurgo soon mentioned Gaza and repeated Israel-hating Amnesty International’s figure that 300 children were killed during Operation Cast Lead. But Amnesty and the United Nations class a child as being “under 18”. So a 17 year old Hamas fighter pointing a gun at an Israeli soldier being shot dead in self-defence is classed as “a child”. Morpurgo also gave the impression that from the moment he entered Gaza to the moment he exited it two days later that the Israelis were hell-bent on killing Palestinian children. So there you have it, the modern day reincarnation of the anti-Semitic blood libel. In the old days this involved the accusation that Jews abducted and slaughtered non-Jewish children and used their blood in religious rituals. 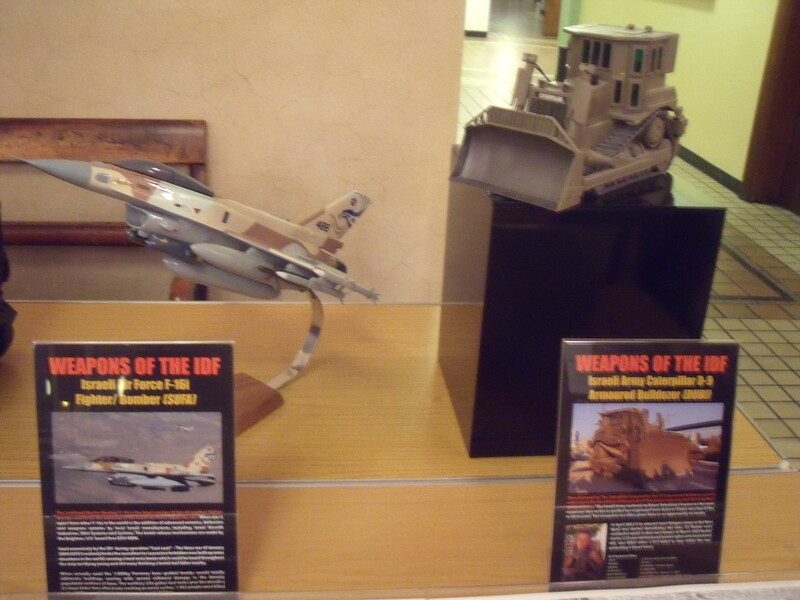 Nowadays it is Israelis, or Jewish Israelis to be more precise, who, allegedly, just kill them “like a video game”. Morpurgo admitted that he didn’t know if the claims by a doctor from Medicins sans Frontieres that the shots came remotely from Tel Aviv were true, but he made them anyway. For Morpurgo it doesn’t matter because it sounds like a wonderfully sad story, which he is in the business of telling. He mentioned his visit to a village where “Arab and Jewish children play together and learn together”, but this mention of “Jewish children” should raise alarm bells. Why were the Israeli children described by him in terms of their religion and not their nationality, unlike the Arab children? But if Morpurgo was really concerned about the rights of Palestinian children he would have highlighted the child abuse prevalent in Palestinian society where children are used as human shields by Hamas, where Hamas destroys childrens’ summer camps in Gaza and where television programmes are regularly aired by the Palestinian Authority on which children claim a desire to grow up to become martyrs. “No facts were checked in the making of this speech”. What a waste of an important speech last February. Instead of bravely speaking up for Palestinian children like he could have, Michael Morpurgo probably only succeeded in adding a little more hatred of Jews into the world. Bar Standards Board clears Michael Mansfield QC of professional misconduct over anti-Israel speech. Jessica Nero and Christopher Osmond lying on floor inside Ahava on November 22nd 2010 shortly after Michael Mansfield's speech at Amnesty. 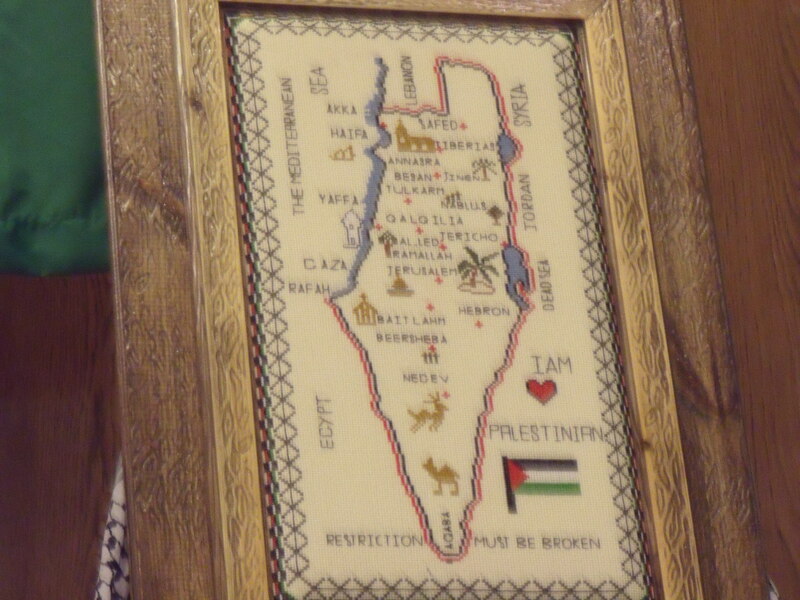 Last night I went to Tooks Chambers for a Haldane Society of Socialist Lawyers talk given by Antonia Mulvey, the Senior Justice Expert for the Norwegian Refugee Council based in New York, on Palestinian housing issues in East Jerusalem and the West Bank (specifically Area C). This was not long after a complaint for professional misconduct against Michael Mansfield QC, one of the senior barristers at Tooks, had been dismissed by the Bar Standards Board. The Russell Tribunal on Palestine had held an anti-Israel hatefest at the Law Society on the weekend of 20th and 21st November 2010. RTOP is a Kangaroo Court where anti-Israel activists get together to make up international law with which to condemn Israel. It’s a bit like playing doctors and nurses, but as lawyers. They even have a “jury” and on 22nd November 2010 Michael Mansfield QC, as head juror, pronounced all the firms “on trial” guilty of complicity in Israel’s “breaches of international law”. This “judgement” was given at Amnesty International. “Yes, I can answer that one directly. The answer is yes. In fact we heard from a lawyer who has been involved in two actions where there were criminal prosecutions. He represented those who had actively protested in relation to two different companies; one in Northern Ireland and one not. And the position is very important and it stems again, not only from the advisory opinion, but it is there in the advisory opinion. Because what the advisory opinion is saying to governments and everyone; we all have an obligation to bring the wall and the settlements to an end, which means that those who wish to, as it were, actively protest in relation to that here, in this country or in Northern Ireland, wish to protest about that, are entitled if and when, they are not always prosecuted, if the prosecuting authority decides that they are, for criminal damage or whatever it happens to be, they are going to prosecute the individuals who entered offices or whatever it is, then the individuals who are prosecuted have a, a defence, sometimes called “necessity”, in which they are saying “there is a greater good”. Yes, there is damage, but the damage was done as of “necessity” to prevent a greater evil being caused. So, actually…if people, come and tell us that is exactly what is being (unclear), and jurors, that’s the interesting thing, courts in the United Kingdom, juries, ordinary people in the United Kingdom, the democratic aspect of our system, are saying “we find you not guilty because of the greater good”. So it’s extremely important that it’s a two-pronged thing: One is proactive, in other words actually going to companies and corporations, the other is reactive, if we get accused then we have a perfectly legitimate defence. And may I just add a foot-note on this. I know time is restricted, what we are equally horrified to note is that the Israeli government is currently considering making protests and objections along these lines a criminal offence. So therefore this is, as I see it, a totally appropriate situation in as much as you are not going to be easily allowed to stick up against it. So, at the very least, Mansfield seems to admit to knowledge of events at Ahava where Jessica Nero and Christopher Osmond entered the store either during or soon after his speech and were eventually arrested. On 21st April 2011 both Nero and Osmond were convicted of aggravated trespass, given 18 month conditional discharges and ordered to pay £250 costs each. And guess who represented Nero and Osmond at their trial? James Mehigan, a barrister at Tooks! The BSB does not have the power to consider allegations of criminal conduct. If you consider that Mr Mansfield QC is guilty of a criminal offence, you should refer the matter to the police in the first instance. I would also point out that Mr Mansfield’s comments were made in his personal capacity and not in connection with the provision of a legal service. Mr Mansfield QC would not have been paid a share of the fees earned by Mr Mehigan. I can see no evidence on the information before me to suggest that Mr Mansfield QC profited from Mr Mehigan’s representation of the defendants and, as explained above, we cannot consider whether or not Mr Mansfield has incited or encouraged a crime. Sadly, the police should have been informed within six months of Mansfield’s speech, incitement being a summary-only offence. I will leave you to draw your own conclusions, but please be careful if leaving a comment below the line. I don’t want to be sued. 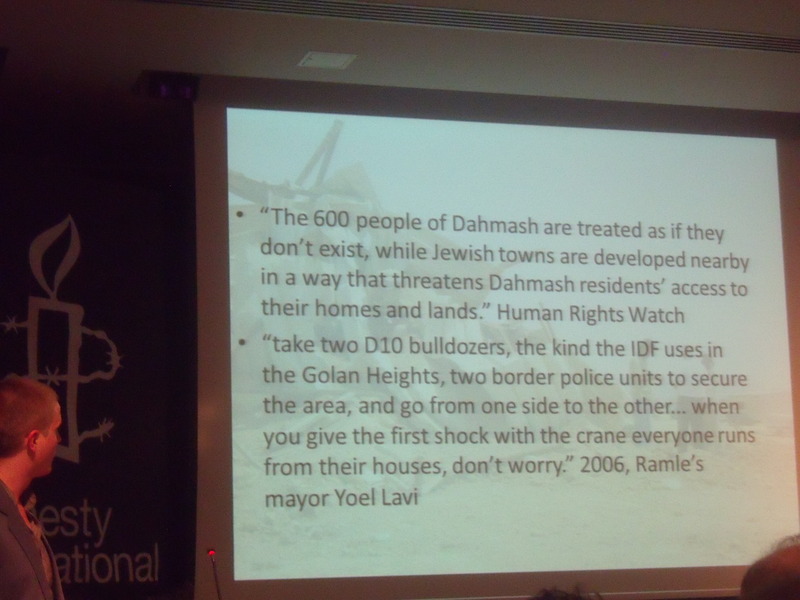 As for last night’s Haldane Society talk, Antonia Mulvey spent an hour propagandising about alleged illegal evictions of Palestinian “women and children” and the route of Israel’s Security Wall. 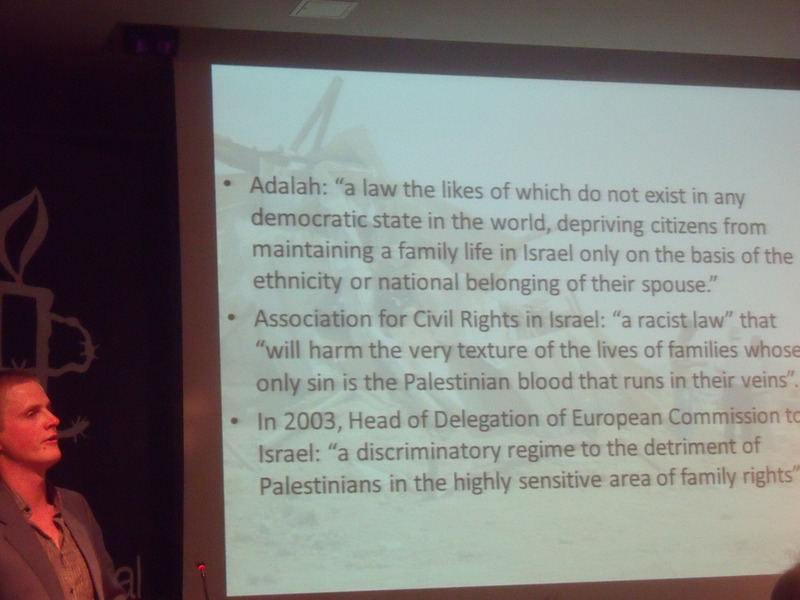 The case studies she mentioned are still being challenged through the Israeli court system. She claimed that a Palestinian family had been fined for nuisance for sitting outside their old home having been recently evicted from it and that Palestinians must pay for the demolition of their homes and for removal of the rubble, which they can’t afford along with the huge fines for not having a valid building permit. 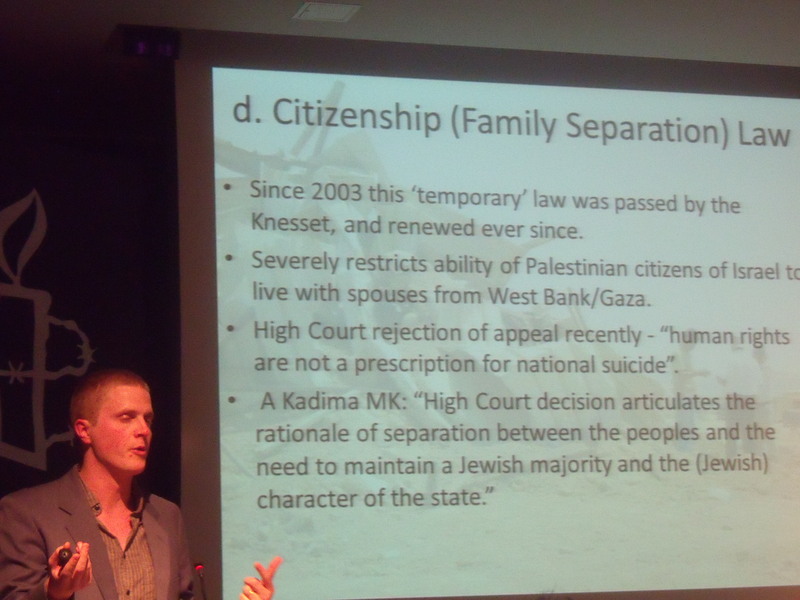 Sat among the audience, some of whom were calling for boycotts of Israel and for Israel to adhere to Jewish values as set out in the Torah (ex-Labour MP Martin Linton even accused Israel of “ethnic engineering” the Palestinians in east Jerusalem), I mentioned that many of the case studies given by Mulvey were no different to property disputes common in Britain. I also pointed out that the backdrop of Palestinian terrorists constantly attempting to murder Israelis might mean that Palestinians were inconvenienced by the route of the security wall. I asked whether she preferred the inconvenience or more Israelis, like three-month old Hadas Fogel who was decapitated in her bed by a Palestinian, being murdered. For her answer she relied on the advisory opinion of the International Court of Justice 2004 on the legal consequences of the construction of the wall. Mulvey said that the opinion (which, being only an “advisory opinion”, is not binding) criticised the building of the wall inside the green line. So one might infer that Mulvey has no qualms about the beheading of Hadas Fogel; it being preferable for the security wall to be moved to the green line so exposing even more Israelis to Hadas Fogel and her family’s tragic fate. The Guardian’s Nicholas Lezard uncovers why us Jews are kleptomaniacs. I have an admission to make. You see the place where I live, and in fact the place where I am writing this piece, I have no rights to. That’s right I’m a trespasser, a squatter, a thief, or whatever you think is an appropriate word for a rogue such as me. You see it all happened about 20 years ago. I had nowhere that I really wanted to live until I spied a nice little place in a London suburb one night. The light was on and pensioners Roberta and George Smith had just settled down to watch Coronation Street with a hot cup of cocoa in their hands. As soon as they became engrossed in Corrie I barged in and told them to leave. I gave them 10 minutes to pack up their belongings and get the hell out. I have been living here ever since and very nice it is too. The local council has passed a motion that the Smiths have a “right of return”, but I refuse to budge. You see it isn’t my fault, I tell the council. The problem is I’m Jewish and that is what us Jews do. If there is something we want, we just take it. I mean we did it in 1948 too, I tell them. There was this already fully functioning state called Palestine full of millions and millions of people who had lived there since the dinosaurs, and the Jews (who hadn’t lived there since the dinosaurs) suddenly appeared from absolutely nowhere and took over their houses, farms and businesses and told them to get the hell out. But it wasn’t those Jews’ fault either, I said. Just like a Tourette’s sufferer can’t help himself when swearing so us Jews just can’t stop ourselves from thieving. Thanks to Nicholas Lezard, literary critic for The Guardian, I have recently discovered an explanation for all this; thieving might actually be in our DNA. Lezard has uncovered a dirty little secret that has been kept hidden from us Jews and which explains a lot; one of our great forefathers, Moses, was a bit of a tea-leaf himself. So now, thanks to Lezard, the truth is out; Moses, like me and probably you if you are Jewish, also stole land that wasn’t his. You see when Moses led the Jews out of slavery in Egypt he led them to this already fully functioning state called Canaan full of millions and millions of people who had lived there since the dinosaurs and the Jews suddenly appeared from absolutely nowhere and took over their houses, farms and businesses and told them to get the hell out….